The weather for the coming weekend was predicted to be wet and cold, and we wanted to tick off a couple of things before it changed for the worse. The key thing we wanted to do was to climb to the summit of the Pic du Midi de Bigorre. 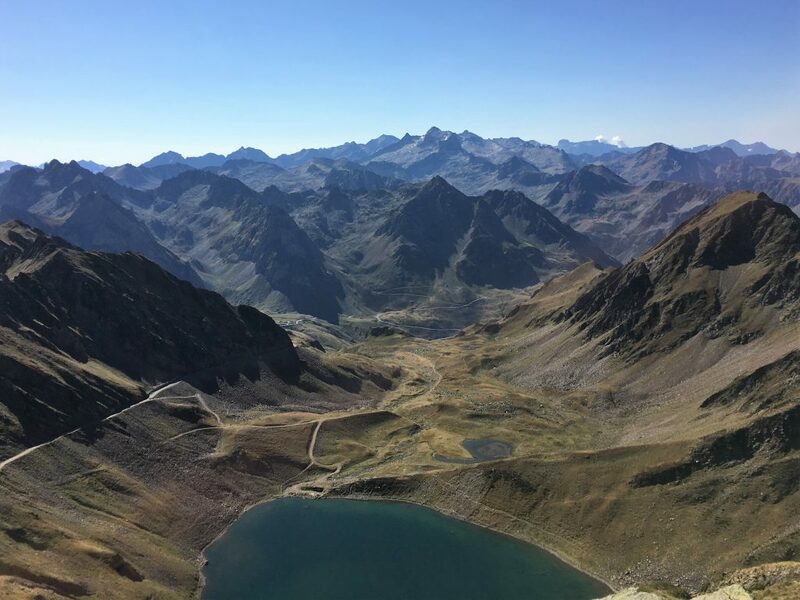 This 2877m high mountain is not the highest in the Pyrenees, but it’s position as an outlier from the main mountain chain means that it offers incredible views. It’s great height in comparison with the surrounding peaks also makes it ideal for astronomy and so it has a large observatory right on the top of the mountain. 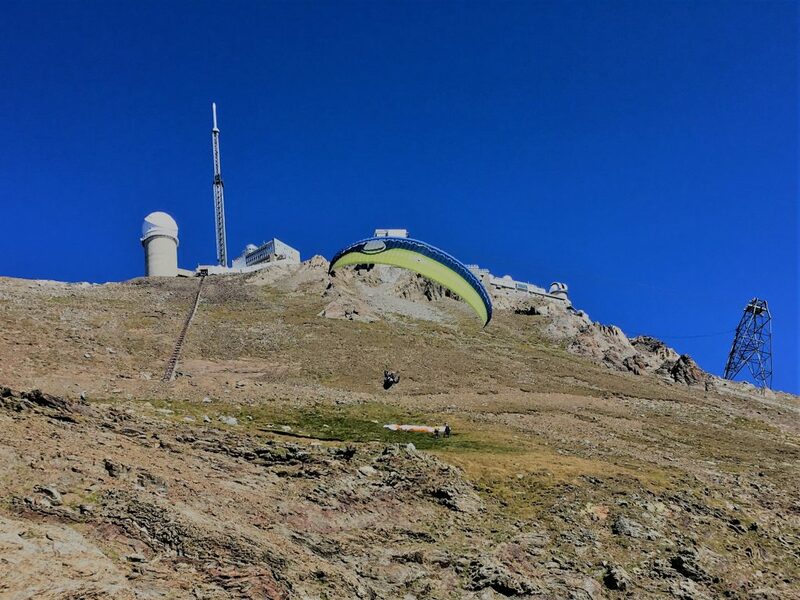 The observatory and associated cable car provide an alternative route to the summit from the ski resort of La Mongie. 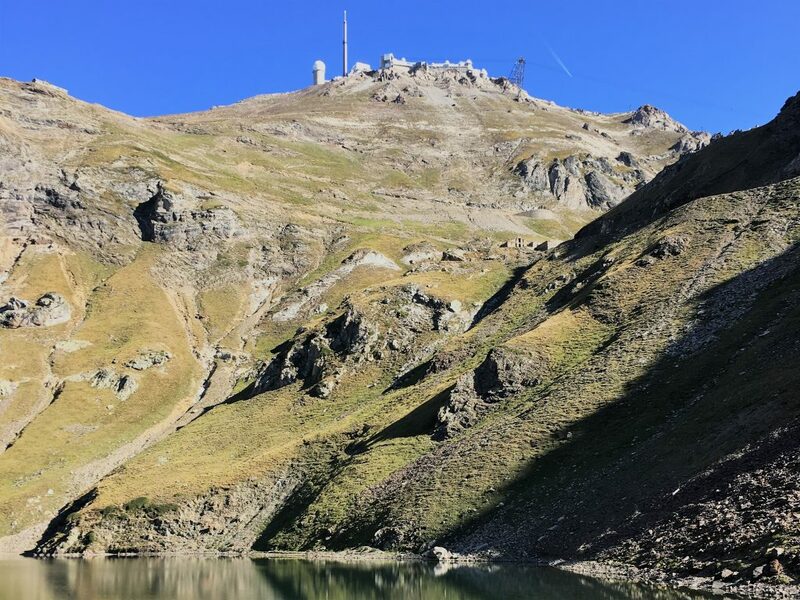 In order to get to the Pic du Midi (there are two Pics du Midi in the Pyrenees – so the de Bigorre bit is quite important, but for this blog post I shall shorten it) we either had a couple of cols to cross or a long detour. Bertie is quite used to mountain roads, so we approached the Col d’Aspin with confidence. The road up was mostly that ‘one and a half cars wide’ size that meant we could generally ease past any oncoming traffic at the wider points. However when we met a coach coming the other way we had to reverse to find a spot big enough for both of us. My heart was pounding as we reversed downhill along the edge of a long drop. It was only about 20 meters but it really made me glad for Paul’s confident driving. At the top of the Col we got our first sight of the Pic du Midi in the distance, the observatory glinting at the top of it’s rounded peak. We stopped here for a short while before descending into the valley to find our parking spot for the night. Payolle lake is in an area of valley parkland. It’s a leisure area with multiple walking and cycling routes as well as the lake. 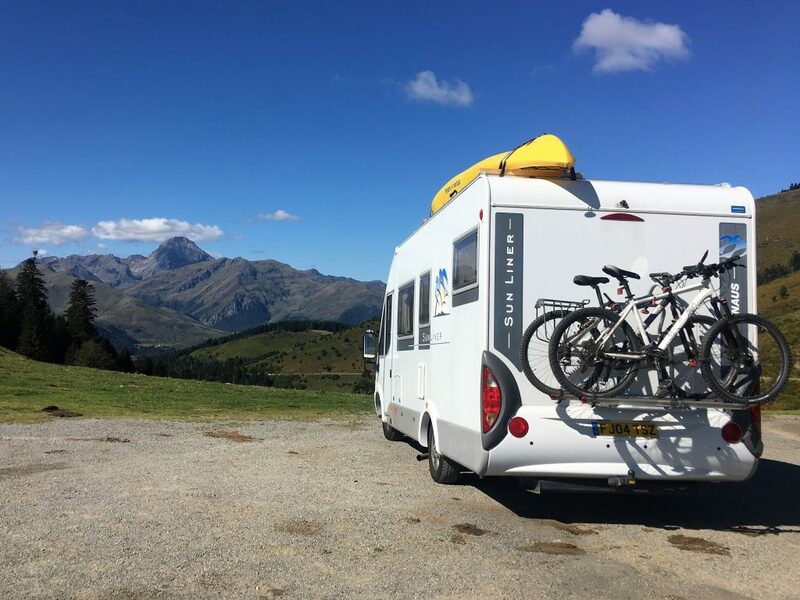 It has holiday chalets, cafes, a designated aire and a motorhome service point. Confusingly we parked with the majority of motorhomes in a large parking area near the service point which wasn’t the aire. That afternoon we had a short cycle around the area just to explore the area. It was so pleasant we decided that we should tackle one of the official mountain biking routes before we left the following day. So after a quick investigation we decided on route 18. 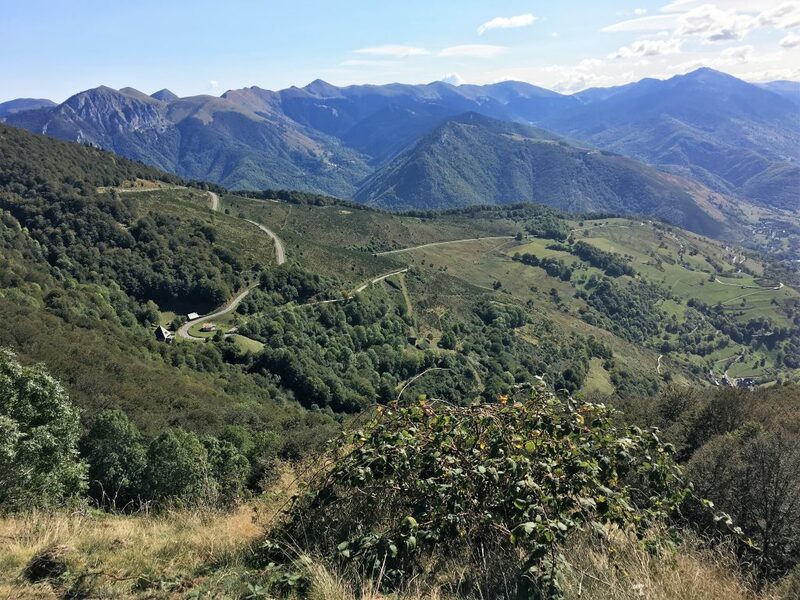 It would take us up above the Col d’Aspin and looked roughly equivalent to the ride we had done in Superbagneres a couple of days previously, but this time we would go uphill first which made me much happier. So the following morning we set off, heading back to the lake and up the D113 for a short while until we reached the signpost where the track branched off through the forest. 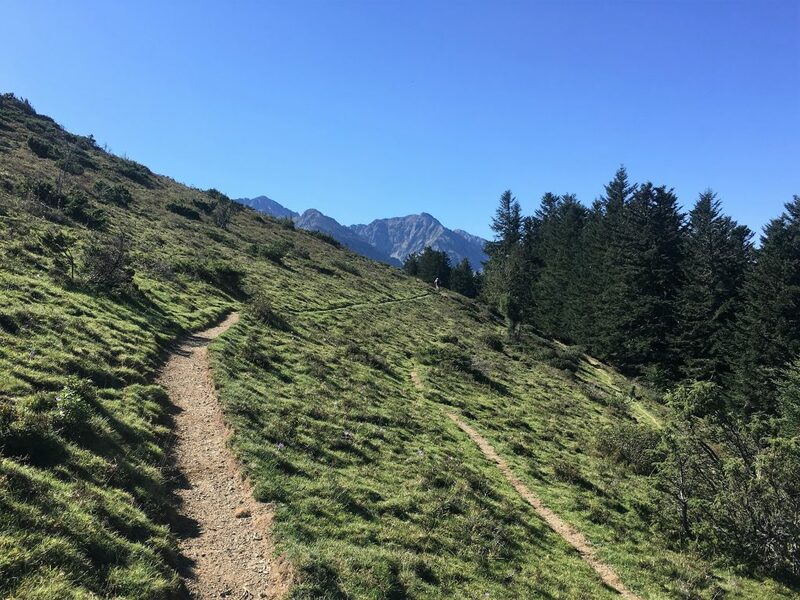 This track took us eastwards up a gentle incline on a well made forest track with occasional views down to the lake below and the Pic du Midi in the distance. After a couple of hairpin bends we were heading south just below the ridge, initially we were still on a track but – at a point we missed and had to backtrack to – the mountain bike route diverged off to the left. Here it became a pleasing single track route following the contour just below the ridge line and above the forest. Roots and rocks made it interesting enough that we had to keep our eyes on the path rather than the view that was opening out in front of us, but that was a good excuse to stop for a few minutes and take in the panorama along with a slurp of water. After enjoying this route for a little longer we reached the road at the Horquette d’Ancizan. We followed the road downhill for a short while until the road turned sharply to the left and we followed a track straight ahead. This rocky track took us steeply back down to our starting point. In all a pleasant morning’s ride. After the bike ride for a change we felt energised rather than knackered. We had a spot of lunch, used the services and the headed onwards. This drive would take us over the Col du Tourmalet to our parking spot for the night and the disembarkation point for our ascent of the Pic du Midi. 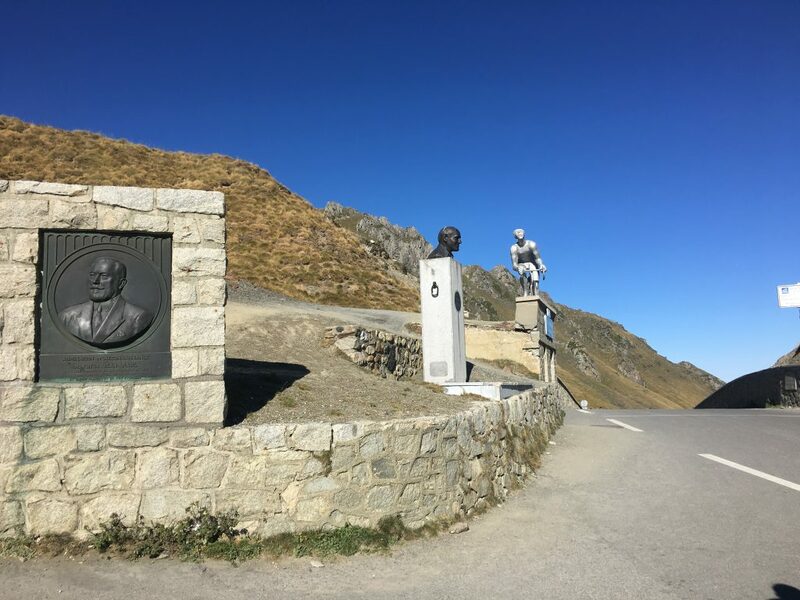 The Col du Tourmalet is the highest road pass in the Pyrenees and is used regularly as part of the Tour de France route. On both sides of the col there are ski resorts whose slopes and lifts join up in winter when the road is shut. We found this col a lot less exciting than the Col d’Aspin. It’s road was wide for the majority of the climb – only the section between the two ski resorts was narrower and even that was not so narrow that passing places would be needed. It was busy busy with tourists – including us – taking their obligatory photos. Once we had done the tourist thing we descended a short way down to a small parking area beside the road. The following morning we had difficulty waking up, the outside temperature was cold even though the sun was shining and we didn’t want to get out of our snuggly bed. We could hear the arrival of cars and chattering of people outside. By the time we had got out of bed the car park was pretty full and we could see the line of walkers snaking up the path. The a coach turned up and disgorged about 30 more walkers. By the time we had eaten breakfast and packed our rucksacks we were the last in a long line of walkers. Walking in such a busy place is highly frustrating and we were kicking ourselves that we hadn’t taken advantage of our overnight parking spot to be up bright and early. Stuck behind people who were walking at a slower pace than us meant we were always on the lookout for opportunities to overtake, and so we ended up going at a faster pace than we would normally find comfortable. By the time we got to the Lac d’Oncet I was puffed out and needed a rest – and of course people started overtaking us again! From the Lac d’Oncet onwards it was a bit easier though, the path was wider and the gradient steeper. The crowds thinned out and we could take the rest of the walk at our own pace. Above us the domes of the observatory looked like a temple on the top of the mountain, with us as penitents crawling up the steep slopes. Finally at the summit we stopped for our lunch on the free terrace (the paid area was €18 each). The views from here were far reaching but a little too hazy to make great photos. On the way down the distant visibility improved a little. 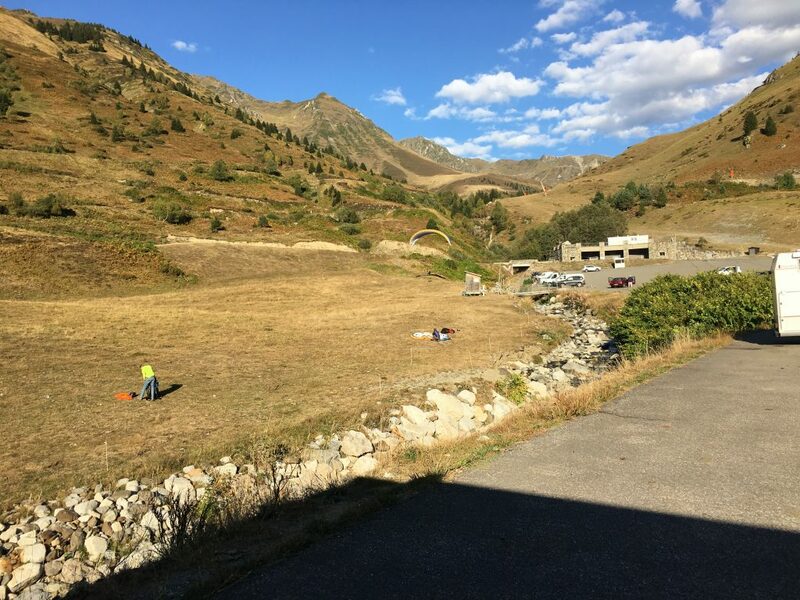 We retraced our steps on the way down, stopping to investigate a couple of the abandoned buildings and to enviously watch some paragliders taking off from the slopes above us (this is an activity that is definitely on our bucket list). Down in a valley near Bertie a dead cow had attracted a few vultures, it looked too recently dead to make them a good meal. We were glad to have done the walk, it was an easy route but the highest summit we have reached without a guide. In a way it reminded us of the tourist route on Ben Nevis, an iconic mountain but not the most thrilling ascent. That evening we descended further down from the col to Tournaboup where there is a large car park that serves the ski resort. We parked here, made dinner and had an occasional wander around the car park to stretch out our lakes. 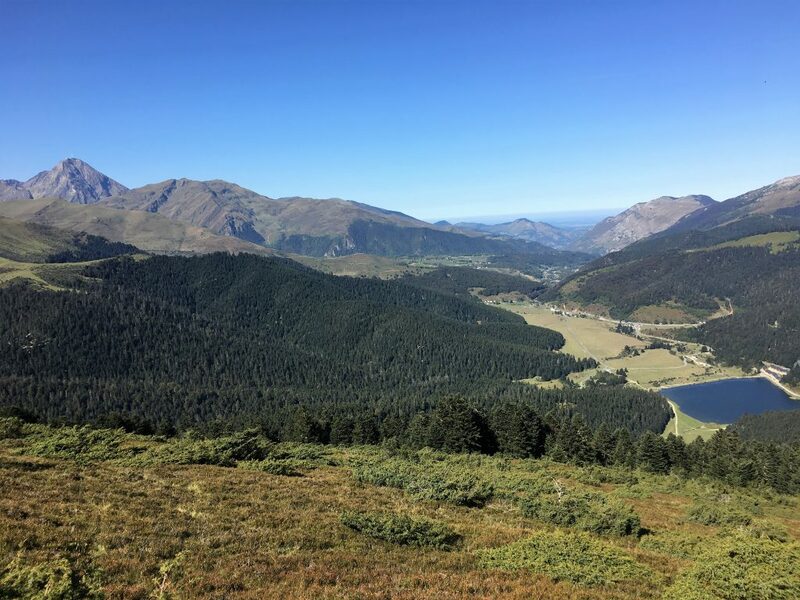 Further Information: IGN Carte de Randonnees Pyrenees 4. Payolle VTT map.